VSE Corporation was established in 1959 to provide engineering and technical services to the owners and operators of transportation and equipment assets and large, mission critical fleets (ships, vehicles and aircraft.) VSE serves this market by extending the service life and modernizing these aging platforms. We are a preferred strategic partner, providing customized solutions to improve operational readiness and capability across a wide array of mature platforms. We characterize the majority of our work as "sustainment services," consisting of supply chain management (SCM) and maintenance, repair and overhaul (MRO). 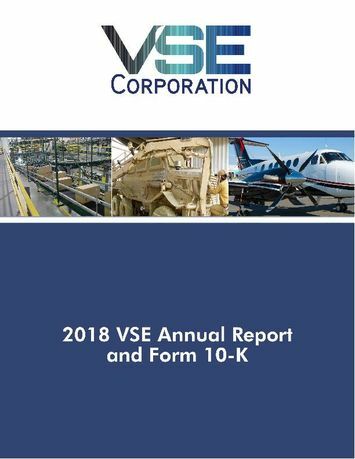 VSE, the parent company, conducts business operations through our Federal Services Group and our wholly-owned subsidiaries, including Wheeler Bros., Inc., VSE Aviation, Inc. (which includes Prime Turbines LLC, CT Aerospace LLC, Kansas Aviation of Independence, LLC, and Air Parts & Supply Co.), Akimeka LLC and Energetics Incorporated. Our strength lies in the talented professionals who support our customers through customized solutions to maintain and modernize products, equipment, and systems. Our nationwide network of facilities and offices provides access to a spectrum of corporate resources and services in diversified engineering, logistics, management, and information technology disciplines. We combine their individual skills, experience, and motivation with corporate resources, technology, teamwork, and the management core principles of integrity, agility, and value to deliver high quality, cost-effective solutions to a global customer base. VSE is a publicly traded (NASDAQ: VSEC), ISO 9001:2015-registered SCM, MRO, and professional services company. VSE's subsidiary, Wheeler Bros., Inc. received its seventh U.S. Postal Service Supplier Performance Award for 2013. VSE Aviation, Inc. is an FAA and EASA certified independent provider of MRO and SCM services for aircraft engines and engine accessories. Our Federal Services Group's support to the U.S. Department of Defense has resulted in VSE's ranking among the top 100 defense contractors, top 10 foreign military sales contractors, and top 50 Navy contractors in the nation.